Last week, Hurricane Florence made landfall on the coast of the Carolinas as a Category 1 storm. So far its effects have been devastating, claiming the lives of 32 people as millions more deal with widespread flooding and loss of power. The storm has also caused a huge amount of damage to buildings and roadways along the coast. According to one estimate by Moody’s Analytics, the total cost to repair all this destruction could climb as high as $20 billion. But some experts fear that even this high estimate could be too low. Another study conducted by Oxford Economics found that the region’s total losses could range anywhere from $30 billion to $40 billion. After all, the overall amount of damage will likely increase as flooding continues to spread after the storm’s initial impact. “These estimates are based on the information available, and there is a high probability that Florence’s costs will be revised significantly higher with added information or inland flooding,” read a statement from Moody’s Analytics. No matter what its price tag ultimately becomes, though, Florence will rank as one of the top 10 costliest hurricanes in American history. 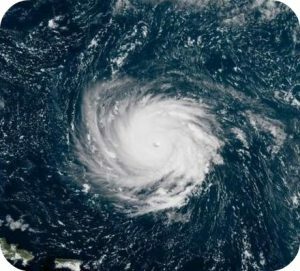 And while the Carolinas face a long road of recovery ahead, experts say that the storm won’t have too much of an effect on the U.S. economy as a whole. With the region accounting for about 1.1 percent of the nation’s GDP, analysts say that the damage from Florence should only decrease quarterly growth by 0.2 percent. Of course, these statistics mean little to the millions of Carolinians who are fighting to keep water out of their homes. In fact, only about 335,000 households in the region have flood insurance, meaning that many people could end up paying out of pocket for repairs. Why do you think Hurricane Florence will have such a small effect on the overall U.S. economy despite causing extensive damage? Why do analytics agencies like Moody’s estimate the economic impact of disasters like Hurricane Florence? Sources: Paul Davidson, “Hurricane Florence, Despite Destruction, Will Likely Have Small Impact on US Economy,” USA Today, September 18, 2018; Mary Williams Walsh, “Millions of Carolina Homes Are at Risk of Flooding. Only 335,000 Have Flood Insurance,” The New York Times, September 19, 2018, Patti Domm, Hurricane Florence Damage Estimated at $17 Billion to $22 Billion and Could Go Higher — Moody’s Analytics,” CNBC, September 17, 2018. Photo by U.S. Customs and Border Protection. 1. Because Carolina is a small proton of the U.S. Also, the residents relocated and continued to contribute to the economy. 2. Analytics agencies estimate the economic impact of disasters to give economist an idea of what to expect in relation to risks and financial difficulties.